Clay has been helping people heal for thousands for years. The medicinal value of clay was no stranger to Ancient Egyptians or the Native Americans who valued its powers. Clay is a form of volcanic ash, the same ash that flows down the side of an erupting volcanic mountain. As the ash settles and cools, various types of clays are formed. 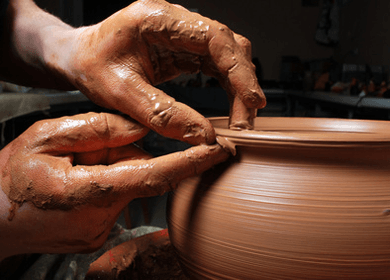 The healing powers of clay can be attributed to its alkaline pH and exceptionally high negative ionic charge. We live in a highly toxic culture where there seems no safe place to hide. There are over 70,000 chemicals used in the United States for commercial products. According to the Environmental Protection Agency, 65,000 of these chemicals are hazardous to our health. Toxins contaminate much of our food and we daily lather and slather personal care products on our skin that are loaded with dangerous chemicals. Our bodies are made to naturally eliminate toxins, but when the insult becomes more than we can take, the toxins begin to build up inside. Signs of toxic buildup include such things as lack of focus, joint paint, digestive problems, fatigue, irritability, bloating and high acidity. Eventually, we become overrun with toxins, which can lead to serious health complications. Detoxing naturally helps the body do its job and allows us to regain health. There are many ways to detoxify, including eating a healthy diet, exercising and sweating, but clay therapy is gaining much popularity as a highly effective detoxification option. Clay is a mass of super charged minerals that receive a negative charge from the heat action of the volcano. When clay and water join, the clay energizes and stimulates cellular repair and restoration within our body. The energy provided by the activated clay helps the body to restore the balance that is necessary for healthy living. The negative power of the clay draws the toxins, including heavy metals, to it and carries them out of the body. Clay allows the body to utilize nutrients, vitamins and minerals by taking the detoxification burden off of the liver and kidneys. According to clay experts, clay acts like a catalyst, lowering the energy requirements for reactions to occur. While there are many different kinds of clay, the safest, easiest to use and least expensive is Sodium Bentonite Clay. It can be safely taken internally to improve overall digestive health and reduce toxic overload. Internal parasites are also drawn to the clay and can be expelled just as the toxins and metals are. Clay baths, topical applications and poultices draw toxins out of the skin and reduce inflammation. Clay masks improve circulation and provide deep cleaning. For best results, purchase only high quality clay and be sure to follow all directions before using. Hey Buddy!, I found this information for you: "The Surprising Detoxifying Powers of Clay". Here is the website link: https://www.thealternativedaily.com/the-surprising-detoxifying-powers-of-clay/. Thank you.